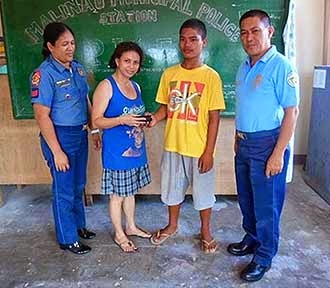 MALINAO, ALBAY—A 16-year-old pedicab driver was commended by the Malinao Municial Police Station headed by PSI Arthur R. Gomez for turning over a wallet that was left in his vehicle. The driver, Garry Cobilla, is a resident of P-2 Balza of this town. The police was able to verify that the wallet belongs to Daisy Argiga. Argiga, a teacher who is based in Antipolo City, lost the wallet when she went to Malinao to visit her sick mother.